To meet the planned electrical, heating and cooling load growth of the Campus, UES implemented a $73.25 million phase of the UES Master Plan to install a 45 MW Combined Heat and Power (CHP) system. TAMU was only one of nine recipients nationwide to receive a DOE grant to help finance this $73.25 million major CHP system upgrade. This $10 million DOE grant awarded to TAMU helped fund the project. The system will produce electricity to serve a significant portion of campus power needs and steam for heating and cooling of campus facilities. The CHP system efficiency is 70% or greater and significantly improves the overall operating efficiency, reliability and emissions profile of the University. This CHP system consists of a GE LM2500 +G4 natural gas‐fired combustion turbine with a 210,000 lb per hour EIT heat recovery steam generator, together with a Dresser‐Rand backpressure steam turbine, with 600 psi input and 20 psi exhaust steam serving campus heating loads. This new 45 megawatt CHP power and steam generation capacity replaces the previous generation of CHP equipment and collectively with an existing 5 megawatt steam turbine generator; TAMU has 50 megawatts of power generation, together with purchased power capacity to serve 23 million gross square feet of facilities and over 5,000 acres on the TAMU campus. The system operates at a heat rate of 8,100 mBtu/ MWh and at approaches 70% efficiency. 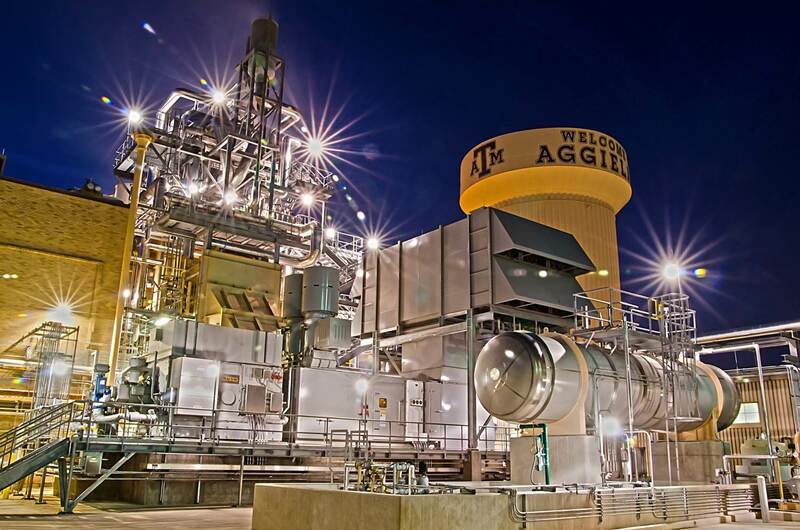 The new CHP plant is an integral component of comprehensive mission‐critical utilities and energy services provided at TAMU, which includes utility production and distribution combined with comprehensive demand‐side energy management. CHP has been an important component that has made it possible for TAMU to reduce energy consumption by over 40 percent per gross per square foot over the last 10 years, resulting in close to $140 million cost avoidance. As a result of the CHP Project completed in 2012, purchased energy cost avoidance of over $6 million annually has been achieved through more efficient power and thermal energy generation, together with a significant reduction in GHG emissions. The new gas turbine generator and heat recovery steam generator were placed in operation in August 2011, with the new steam turbine generator available for operation in March 2012. 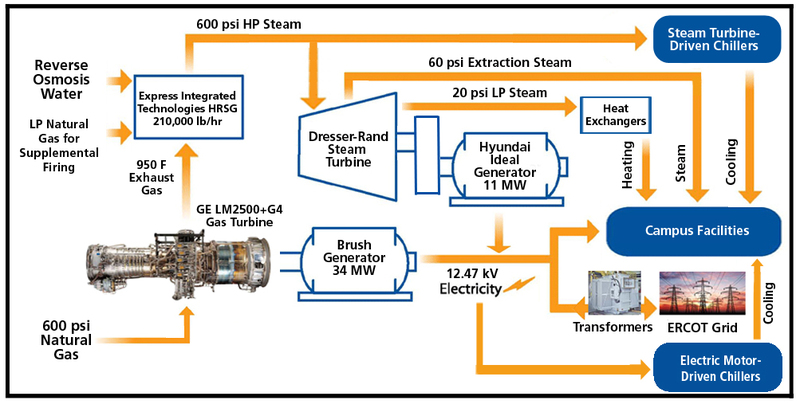 High pressure, superheated (600 psi, 750F) steam is produced by the heat recovery steam generator (HRSG) using gas turbine exhaust, together with supplemental firing capability, to provide 210,000 lb/hr in steam generation capacity. The 600 psi steam is used to drive a back pressure turbine to generate additional electricity while providing low pressure (20 psi) exhaust steam for heating hot water and domestic hot water service to campus. 600 psi steam generated in the HRSG is also used to drive steam turbine‐driven chillers along with electric motor‐driven chillers, and provide district cooling to 19 million gross square feet of conditioned facilities on campus. The CHP system provides up to 70 percent of the campus heating for heating hot water, campus steam distribution, and domestic hot water uses and up to 35% of the university’s cooling requirement through the use of steam turbine‐driven chillers. 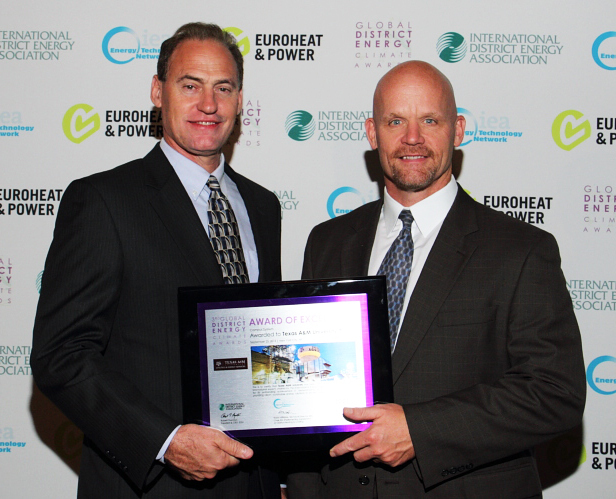 In addition to providing heat to serve 70 percent of the total campus heating demand and the campus steam distribution system, the CHP system also provides heat to serve domestic hot water for all student housing, dining facilities, and a number of other general use buildings. TAMU has the capability to sell electricity back to the grid and has done so at times when high thermal loads on campus are combined with relatively low electrical demand, but this is only a very small percentage of the time during cold winter weather. TAMU is in the process of designing a 3 million gallon thermal storage tank that will be operational in 2015 and will provide the capability to keep CHP power generation base loaded at all times. Before this CHP system upgrade, the university operated a previous generation natural gas‐fired combustion turbine, heat recovery steam generator, and steam turbine‐driven generator. The new CHP system upgrade increased production capacity, reliability, and efficiency, while significantly reducing GHG emissions. The CHP system in the Central Utility Plant at Texas A&M University is a model plant for high reliability, efficiency, safety, and cleanliness. If you are interested in learning more, please sign up for a Tour of the Central Utility Plant.